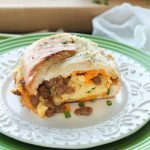 Freezer Breakfast Sandwiches - Dessert Now, Dinner Later! 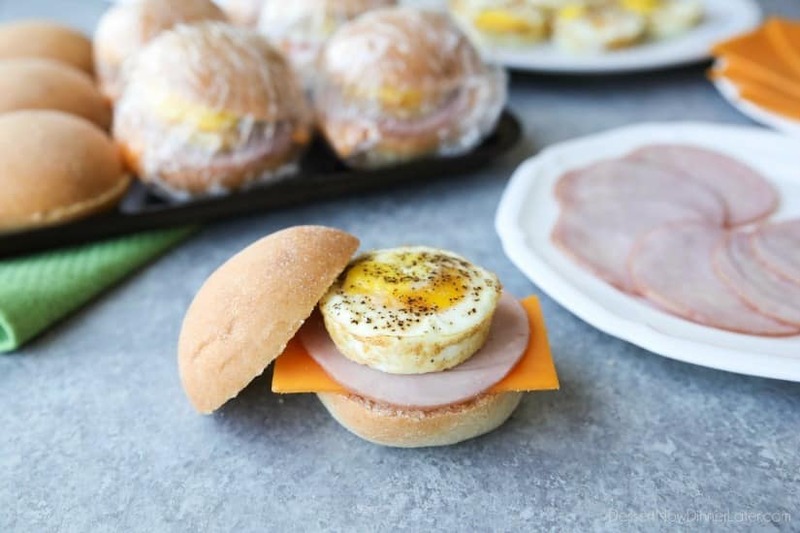 Freezer Breakfast Sandwiches are great for meal prep. 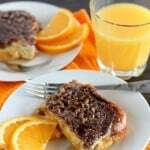 A quick and satisfying breakfast for busy school mornings or on-the-go. School starts in just a few short weeks and I’m already not ready for it. So I’m trying to think of ways to simplify my life when that time comes. 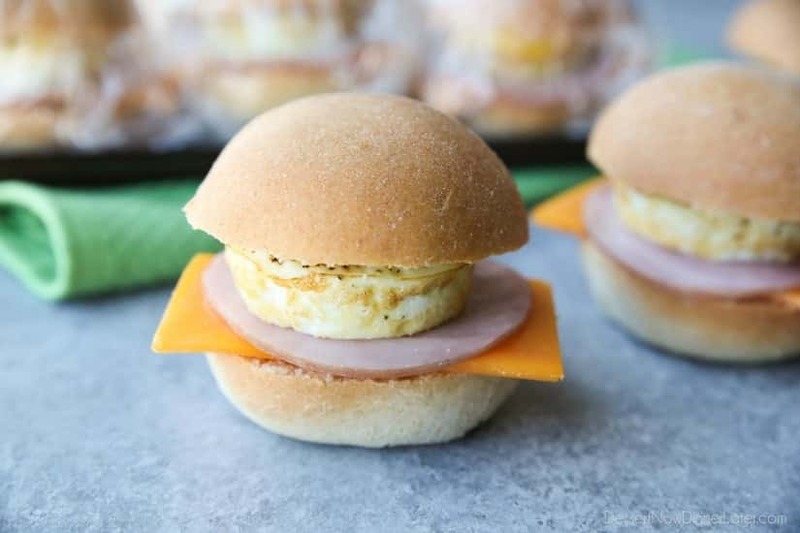 These Freezer Breakfast Sandwiches are one of my ideas. 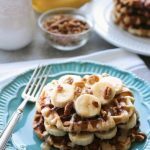 Make them all at once and have my kids heat them up in the mornings. My kids love eating sandwiches using Rhodes rolls. 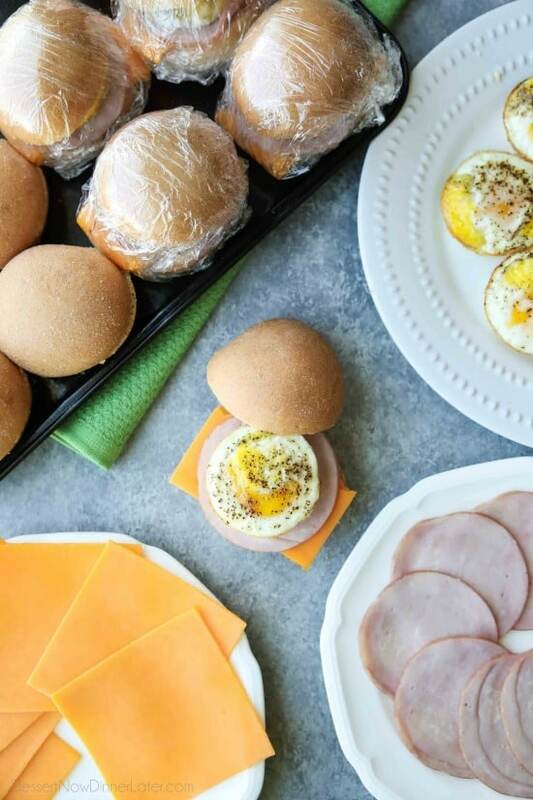 Most of the time we buy the frozen rolls and bake them fresh, but the Warm-N-Serv rolls are really great too. So that’s what we used for these sandwiches. 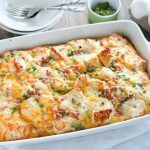 You bake the eggs in a muffin tin, similar to my Breakfast Egg Cups, and then just layer everything together, wrap, and freeze. Then just re-heat when you’re ready to eat. Easy! I feel better about giving my kids something with protein rather than sugary cereal, to fuel them for the school day ahead, but I don’t always have time to fix them eggs. So I like that I have this option, if I prep it on the weekends. 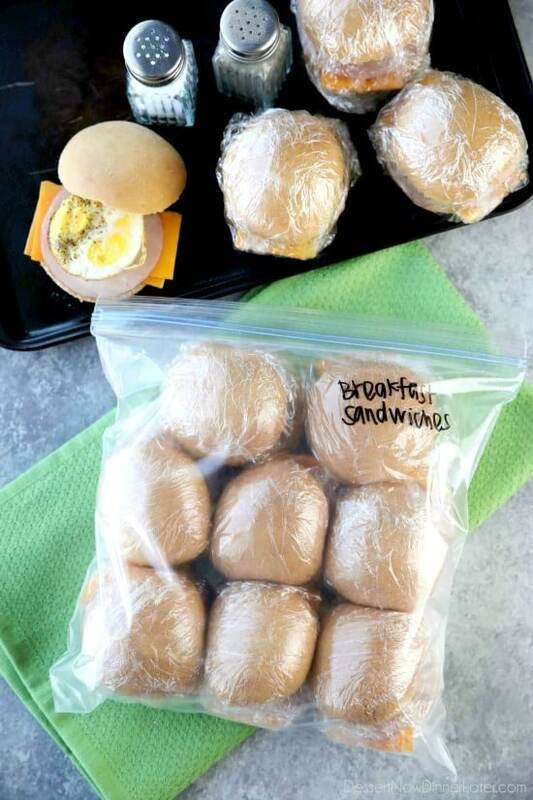 What food hacks do you have for busy school days? Recipe added 9/5/17. For a step-by-step photo tutorial, visit the Rhodes Bake-N-Serv Blog. Grease a muffin tin with cooking spray. Crack one egg into each cup. Break yolk with a fork and season with salt and pepper. Bake at 350 degrees Fahrenheit for 20 minutes or until set. (NOTE: Whisking the eggs will make them cook faster, and puff up like a muffin.) Allow to cool completely before assembling sandwiches. Cut rolls in half with a serrated knife. On the bottom half of each roll, place one slice of cheese (folded in half), then one piece of Canadian bacon, then one cooked egg. The order is important when it comes to re-heating. Double wrap each sandwich individually with plastic wrap. Place inside a gallon freezer bag for extra freezer protection. Label the bag and freeze up to 1 month. 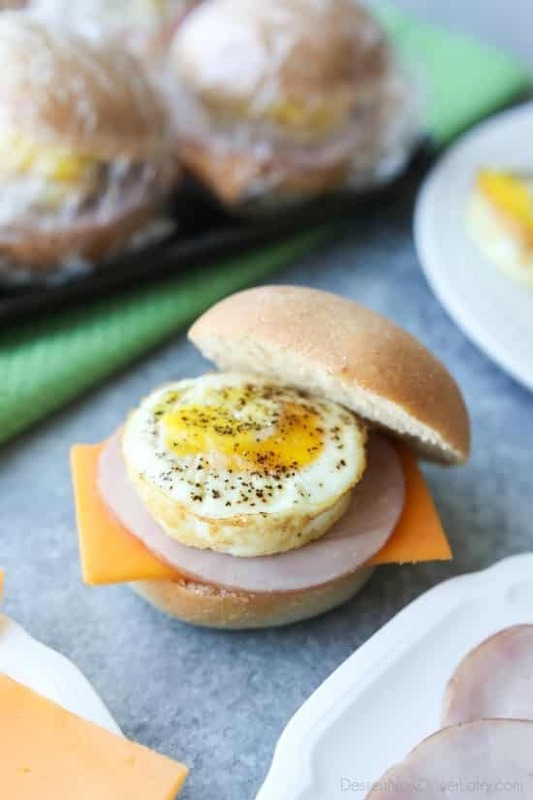 TO EAT: Unwrap the sandwich and discard the plastic wrap, open sandwich in half, separating the part where the egg and Canadian bacon touch, and place on a microwaveable plate. Cook on high for 1 minute. Remove everything but the egg. Cook the egg by itself for an additional 15 seconds or until heated through. Re-assemble the sandwich and enjoy! I do this all the time with the Warm-N-Serv rolls. 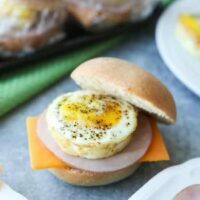 Using the microwaveable bacon or precooked sausage patties instead of ham are great options too! I’ll have to try those other meats too! Thanks!